I've been having issues getting a good first layer to span my entire bed. I built it a year ago or so, I can get away with fairly small prints, as I can just find a decent average for the bed height, and it works. However, if I want a print that spans the bed, I'll have patches where the nozzle is either too high, so leave gaps, or parts where it's too low and drags material. I thought I should probably stop living with it, and finally get some advice on how to remedy this. What happens in those macros? 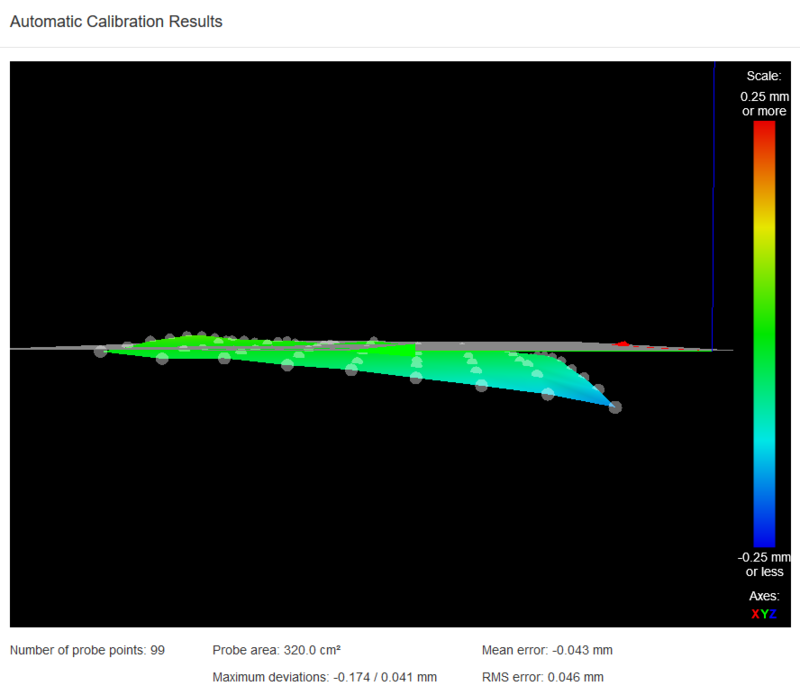 And why are you forcing the z height to 0.9 after the probe has supposedly found it? That would explain the odd height map perhaps. Main firmware 2.02 at the moment. But I've had the issue since I built the machine, which would have been 1.17. The macros are nothing special. As for why I'm setting z to 0.9. I can't rememebr my reasoning for this, I think it's because if I don't then homing fails on account of z being a negative value when the probe completes. I'll have to test that later. Get rid of the G92 Z0.9, it's probably what's causing the substantial height error when you do bed probing. 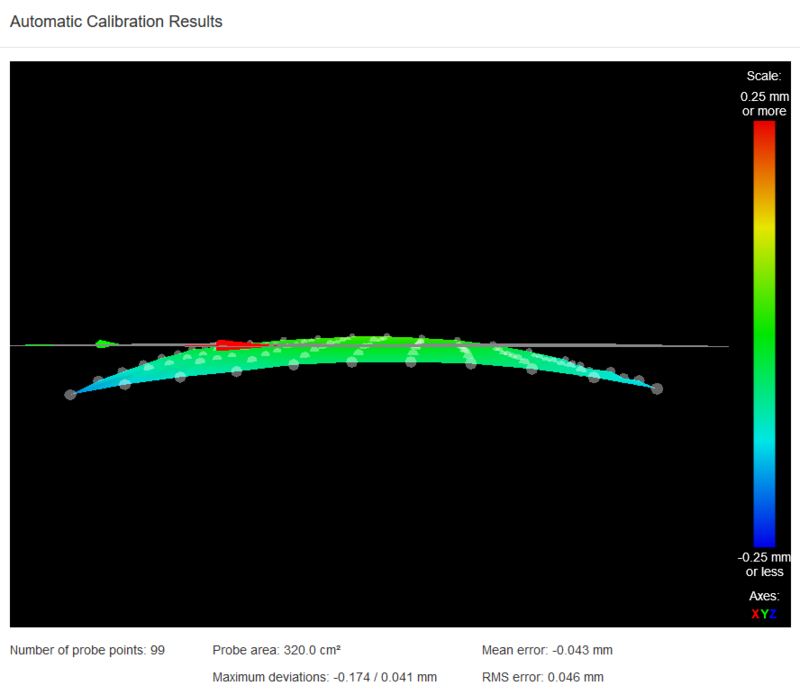 Measure the trigger height of the Z probe as described at https://duet3d.dozuki.com/Wiki/Test_and_calibrate_the_Z_probe#Section_Calibrate_the_Z_probe_trigger_height. @andywm What you have in those macros is a very odd way to home Z.
G30 S-1 is used to measure your probe trigger height, not set your Z height. And setting the Z height with G92 Z0.9 is defeats the purpose of probing entirely. G1 X100 Y100 ; Move probe to bed center. No need to command the BLTouch pin at all. G30 will do all of that automatically. All you need to do is position it in X and Y in the center of your bed. Use the link DC42 provided above to get the correct trigger height for the probe and put that in your G31 Z command in config.g. 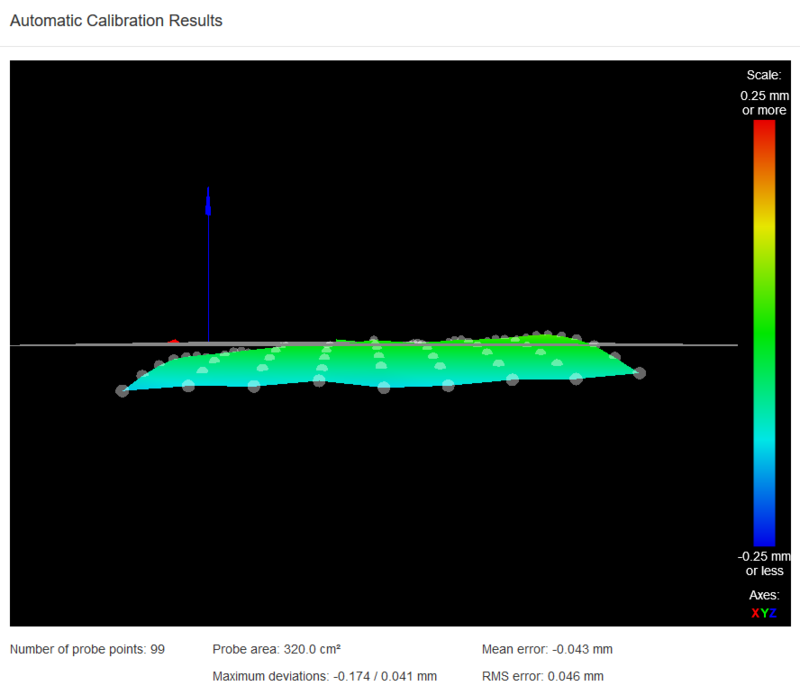 While you're in there, add these parameters to your M558 command to help improve the results of the BLTouch. M558 P9 H3 F100 T6000 A10 R0.5 S0.003 B1 If the travel speed is too fast, reduce the 6000 to something lower. You had 2000 in yours, which seemed a little slow to me. Then rerun G29 to get a new heightmap. I think the results will be much better. Alright. I made the suggested changes. I've not tried printing with it yet, but here's the results. And yeah, my probing macros are weird, they were originally just 4 corner tests for probing the distance at the corners, back when I had a screw adjustable bed. It's now fixed in place using washers. Still definitely has a curvature to it near the edges, which you wouldn't think likely for a piece of glass. 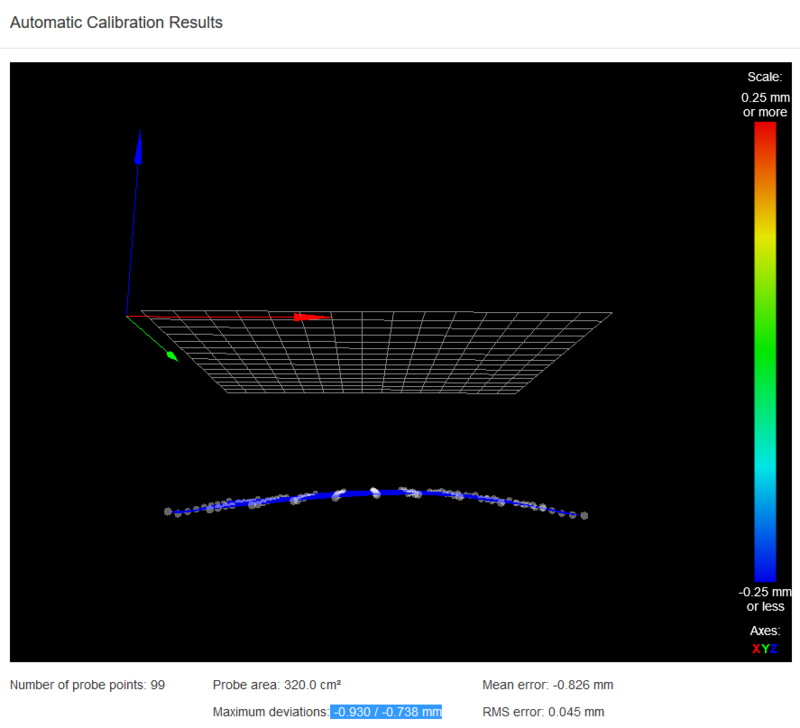 Curvature like that is pretty common on an i3 style gantry. The rods can get bent from head crashes, or it can droop from the weight. That's exactly the kind of thing that mesh bed compensation is great for fixing because no amount of bed leveling can fix a bent rod. 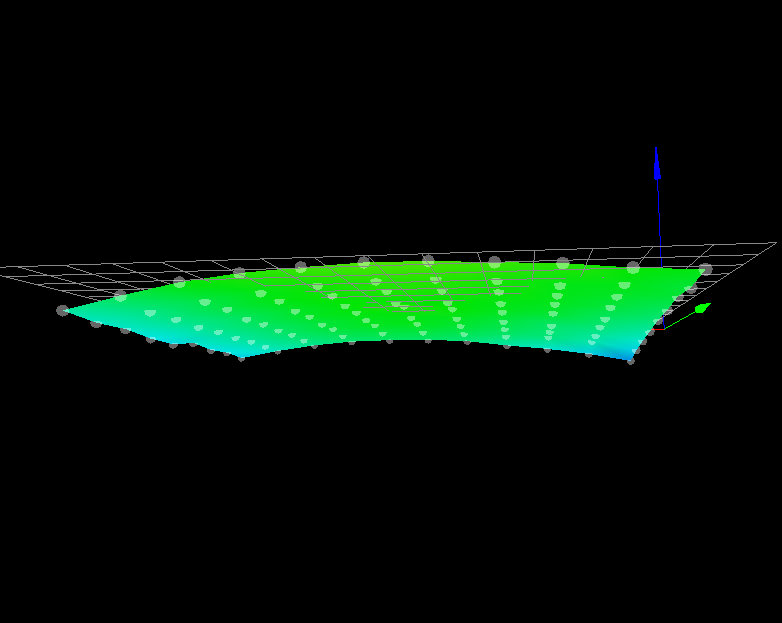 My heightmap looked the same as the last picture.